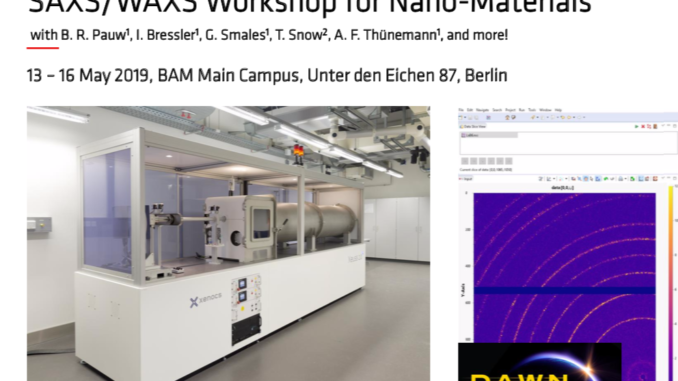 Our group is organizing a small workshop to introduce X-ray scattering to new users. It will take place in the middle of May, but unfortunately, it’s not possible to sign up for it this year yet: we’re running a trial workshop to work out the kinks. As this year is the first time we’re trying this out – and as we’re still developing the program – we have started with a group of internal and external “friendly users”. If everything goes well, we’ll be doing this on an annual basis. If it all goes down in flames, we’ll never speak of this again. Until then, please enjoy the first course advertising poster (see link below). In this workshop, users will be asked to send in their samples. These will be measured before the course takes place, so that everyone can work on their own good data during the four days. Besides the experts from BAM, we’ll also have colleagues joining us from abroad to round off the expertise. Together, we should be able to guide the users through the concepts and practice of data collection, the data processing requirements of their own data, have them end up with useful final results, and a host of useful new contacts to add to their address book. As for us, we hope to get a few new regular users from these workshops, and help educate and guide new scientists into the field. If all goes as planned, and we assume that it will, we hope to see you next year!